From its inception, young people were actively involved in the development of the 2030 Agenda for Sustainable Development, including through: (a) the formal inclusion of young people in United Nations negotiations related to sustainable development through the major group system, in particular the children and youth major group; (b) consultations with young people held at the national level by Member States to inform their national positions; and (c) the My World global survey. 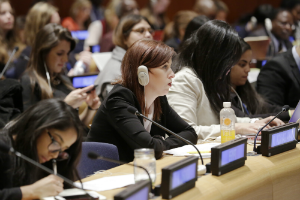 Echoing this participation, as well as the growing interest in and increased policy focus on youth issues as they relate to sustainable development, youth are given specific recognition in the preamble of the 2030 Agenda, and both explicit and implicit references to youth are found throughout its 17 Sustainable Development Goals. The pledges made in the 2030 Agenda to leave no one behind and to reach the furthest behind first, as well as its affirmation to be people-centred, ensure that youth are included in all aspects of the Agenda. At the same time, youth are given specific mention in four areas: youth employment, adolescent girls, education, and sports for peace. Finally, young people are recognized as agents of change, entrusted with fulfilling their own potential and ensuring a world fit for future generations. The new SG report on “Youth development links to sustainable development” provides an analysis of the linkages and complementarities on youth issues between the World Programme of Action for Youth and the 2030 Agenda for Sustainable Development. It also describes recent initiatives in the area of youth policies and programmes based on inputs received from Member States, United Nations entities and civil society organizations. The report concludes with key recommendations for consideration by the Assembly. Read the full SG Report in all UN six official languages.